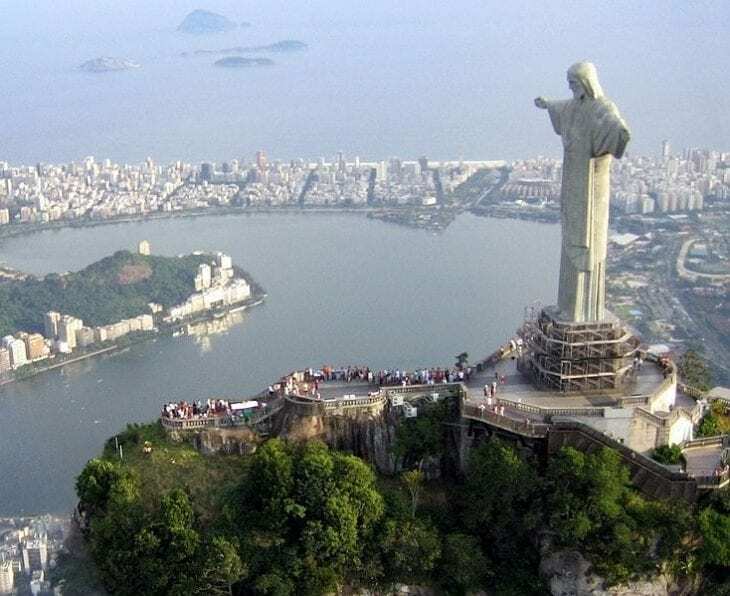 The most famous statue of Jesus is also considered the largest Art Deco statue in the world. It is the 5th largest statue of Jesus in the world with a height of 30 meters (98 ft) – not including its 8 meters (26 ft) pedestal. The statue’s arms stretch 28 meters (92 ft) wide. It is located at the peak of the 700-meter (2,300 ft) Corcovado mountain. The statue has become an icon for Rio de Janeiro and Brazil’s most famous monument. It was constructed between 1926 and 1931. This famous statue of Jesus is located in the small city of Świebodzin in western Poland. It was completed in 2010. The statue along with its mound is 52.5 meters (172 ft) tall, making it the tallest statue of Jesus in the world (when the mound is counted). Also known as Christ the Redeemer, this marble sculpture by Michelangelo was finished in 1521. Located in the church of Santa Maria Sopra Minerva in Rome, it is one of the most famous sculptures of Jesus ever to be created, despite its relatively small size in comparison to the previous huge statues. It reaches a height of 205 cm (81 in). Located in San Salvador City in El Salvador, this statue of Jesus Christ shows Jesus standing on Earth, placed on top of a tall concrete base. The statue was built in 1942 and was damaged to some extent in an earthquake in 1986. Repainting and restoration took place in 2010. A statue of Jesus Christ located atop San Pedro Hill, in the city of Cochabamba. One can reach the statue by either climbing some 2,000 steps, or simply by a cable car. The total height of the statue is 40.44 metres (132.7 ft). The left hand of the statue points to the South, and the right hand points North. A monumental sculpture of Jesus located near Eureka Springs, Arkansas. Built in 1966, the statue is more than 20 meters (67 feet) tall. King of Kings was a 19 meters (62 f) tall statue of Jesus near Monroe, Ohio. Built only in 2004, it was destroyed by a lightning strike and subsequent fire in 2010. Lux Mundi (Latin for “Light of the World”) is a 15.8 meters (52 ft) tall statue of Jesus replacing the destroyed statue at the same location. The new statue construction was completed in 2012. This huge statue of Jesus is located on Mount Nho in Vung Tau, Vietnam. The statue was built by the Vietnam Catholic Association. Its Construction started in 1974 and completed only in 1993. The statue is 32 meters (105 ft) high and standing on a 4 meters (13 ft) high platform, making it a total of 36 meters (118 ft). The arms outstretched to a total of 18.3 meters (60 ft). The statue contains an internal 133-step staircase allowing visitors to climb inside the impressive monument. Located at 3,832 meters (12,572 ft) above sea level in the Andes, on the highest point of the old road between the Argentinian city of Mendoza and the Chilean city of Santiago, right on the border between the two countries. This beautiful statue was unveiled in 1904 to mark the peaceful resolution of a border dispute between Argentina and Chile. Overlooking the city of Lisbon, this statue was inspired by the Christ the Redeemer statue in Rio de Janeiro, Brazil after the Cardinal Patriarch of Lisbon visited that monument. Built during the years 1959-1969. Thank God for HIS unspeakable gift and protection against all works of evil. These great works of sculpture are such magnificent reminders of the majesty of a wonderful Lord and Saviour. Amen! you forgot about Christ Blessing statue in Manado, Indonesia. statue under water close to Porto Fino, Itali? that the good God bless you!